Pictured, from left, are Amy Richards; Livia Rose; Saira Macias-Chavez, Molly Maish and Brandy Smith. WHITLEY COUNTY — The month of March offered up major donations within the Whitko community amidst three highly successful fundraising campaigns: the school-wide mattress fundraiser, the annual Jarrod Day auction and celebration and an FCCLA fundraiser and scholarship. Altogether, $13,965.89 was raised in March with over 50 percent of the proceeds benefitting a Whitko family in need and non-profit organizations. On March 23, the Whitko Jr./Sr. High School hosted a mattress fundraising event. Mattresses, bed frames, pillows, sheets and massage chairs were available for purchase. $6,520 was raised at the event, with 100 percent of the mattress sales being donated to the school. Monies received will directly benefit athletic, drama, band, club and various other programs within the school. Coupling the mattress event with Jarrod Day, the Whitko community rallied together and boosted their own programming, and at the same time found a family within the community who could use a helping hand, the Schwartz family. Jarrod Day began as a school and a community choosing to support a family that was steeped in medical bills. On Oct. 6, 2009, Jarrod Lewis, a well-loved student and athlete at Whitko High School, was in a car accident that caused severe trauma to his body. After several years, he lost his battle with the extensive injuries he suffered from the accident and passed away but the tradition of Jarrod day continues in his name. Proceeds from the event continue to be given to families within the Whitko community that have faced extreme medical and financial need. Dennis Schwartz was the 2019 Jarrod Day honoree. Schwartz is a local resident of both the Whitko community and Amish community. Schwartz fell from a height of 18 feet, landing on top of concrete. After being hospitalized for an extended time, he is now back in his home and continuing intensive therapy roughly three times per week. The Jarrod Day auction raised $3,980.50. Some of the largest purchases made by students and staff were crowd favorites, including a 15-pound giant ice cream cookie purchased for $300 and farm-fresh egg sandwiches purchased for $345. 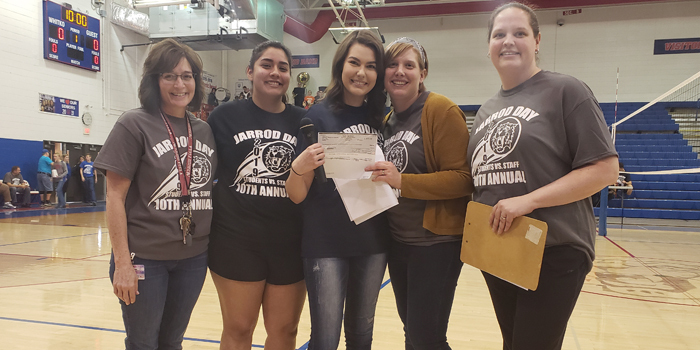 In total, the Jarrod Day event raised $6,295.89 in 2019. Finally, the Whitko FCCLA set a $1,000 fundraising goal in 2018-19 to help one charity in the community and establish an FCCLA scholarship. FCCLA members raised over $1,000 by working in the school’s concession stand during athletic events, a bake sale at the fall and spring plays, and the school’s annual semi-formal dance. In the end, $1,150 was raised. The first donation was given to Jarrod Day. The organization also donated $200 to the Humane Society of Whitley County and $200 to BABE of Whitley County. A $500 scholarship was also set up to be given to a senior student that is active in Whitko’s FCCLA and FACS classes.